Cytographics - What's under the microscope? Guess what's under the microscope today? have combined talents to change the whole earth? Cytographics offers unique images of living cells illustrating their remarkable lives. While our videos are packaged into topics for biology teachers, they will fascinate anyone who is interested in microscopic life. "Viewer's Notes", downloaded from this website free, indicate the content of each production. This is a large protozoan cell called a ciliate, live under the microscope. 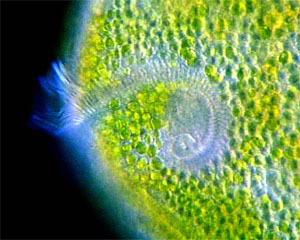 The smaller green objects are living plant cells resident inside it. The image illustrates a seminal evolutionary process. During the dawn of life, cells began eating other cells. To survive, the prey cells resisted digestion and eventually, instead of being regurgitated, they took up residence in the predator, creating a composite cell that combined the capabilities of each partner. This process, "endosymbiosis", profoundly increased cellular complexity by creating mitochondria and chloroplasts. One lineage of endosymbiotic cells generated the green algae which in turn gave rise to the green land plants. So every land plant owes its existence to an ancient endosymbiotic event because every chloroplast came from an ancestral algal cell. Endosymbiosis has happened many times and our DVD: The Kingdom Protista: the dazzling world of living cells shows several examples. Also illustrated is "secondary endosymbiosis" where symbiotic cells were themselves eaten and became symbionts a second (and even a third !) time. Links to reviews appearing in the Journal of Phycology.